BIRMINGHAM, AL, USA – Funded by the Community Foundation of Greater Birmingham’s Community Catalyst Fund, the 18th Street installation will be a permanent public display and is intended to activate underused space and encourage pedestrian traffic in a vital connection between two growing areas of downtown Birmingham. LED technology will be used to ensure the display is energy-saving and cost-effective. Nationally renowned San Antonio artist and sculptor Bill Fitzgibbons has been named lead designer of the project. Additional sponsors include Public Radio WBHM 90.3 FM. The installation is the first of several planned light art projects to be installed across Birmingham’s City Center. “REV is focusing City Center projects in the gaps, looking for opportunities to connect great projects like the emerging Parkside and Theatre Districts. 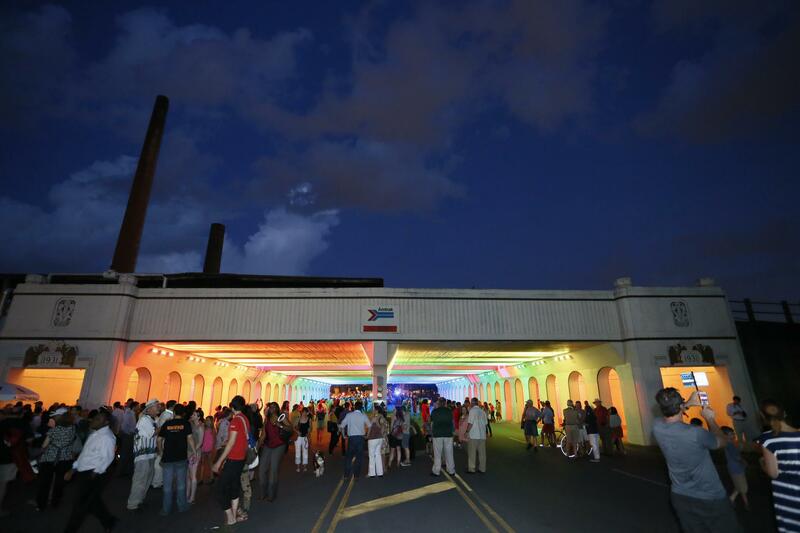 This lighting project is a great way to turn underpasses, which have been barriers, into powerful connectors for pedestrian traffic,” said REV Birmingham CEO David Fleming. REV is an economic development organization that stimulates business growth and improves quality of life in Birmingham, Alabama’s City Center and its Neighborhood Commercial Centers. It is a private-public partnership that was formed in 2012 by the strategic union of Operation New Birmingham and Main Street Birmingham. In addition to the first installation, the Community Foundation has funded the development of a City Center Lighting Plan, expanding on recommendations for increased connectivity in the new Birmingham Comprehensive Plan. The master lighting plan, being developed by a team of local artists, designers and lighting experts, aims to create a vision for liveliness, connectivity, community cohesiveness and a greater sense of security in Birmingham by illuminating key structures and pedestrian traffic points within the City Center and surrounding districts. 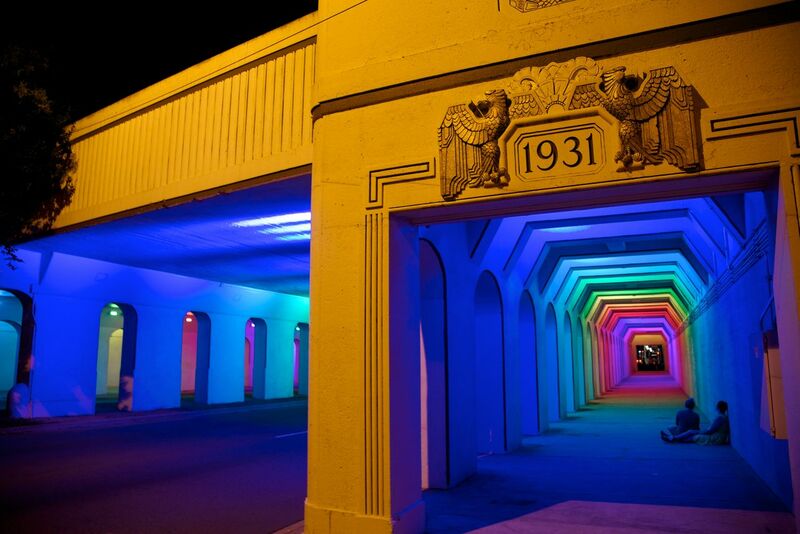 REV is currently working with the City of Birmingham and area developers to identify locations and estimate costs for future opportunities for public and private light-art projects to come online in the near future. As the 50th anniversary of the church bombing nears, artist Elizabeth MacQueen continues her progress towards a September installation in Kelly Ingram Park, Birmingham, Alabama. 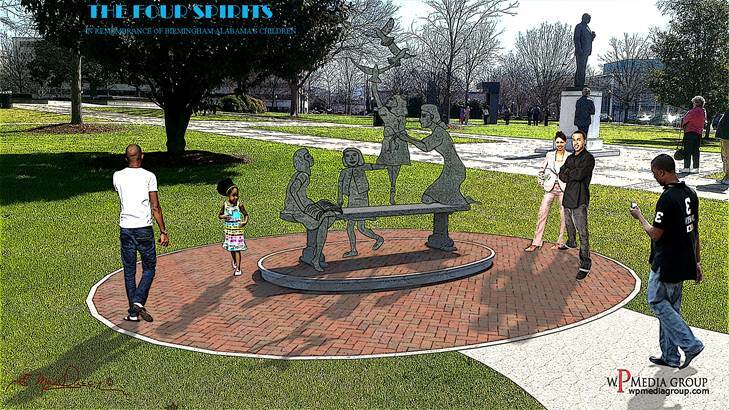 The monument, honors the four little girls killed in the bombing of the 16th Street Baptist Church on September 15, 1963, as well as two young men also killed that day in other acts of violence.